2019 Performance Update! As a 3 year old, Dekadence earned her Premium mare title and was given a brief (2 weeks!) start under saddle. In the next two years she produced two exceptional Gold Premium foals- and so didn’t began her dressage training until a 6 year old. 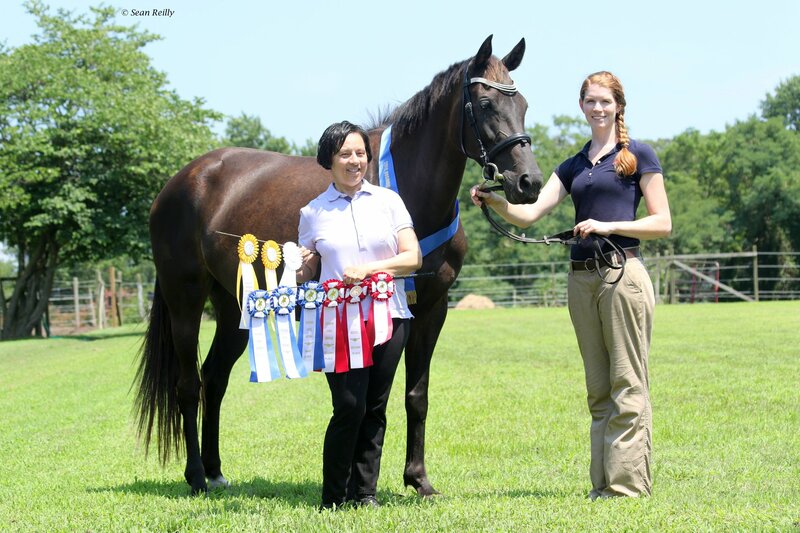 Extremely successful at training level with only a few months under saddle (was 4th at BLM’S , qualified but declined her spot for Gaigs,reserve overall high point for Rosinburg Dressage Series, and won the “Born in the USA” award for Lexington Spring Dressage). We are pleased to share that both her owner, Lesha Cole Williams, and her trainer, Veronica Brennan Walsh, report that the incredible temperament, work ethic, and trainability that I breed for remain true and that we should expect more great things in the near future! Early History: Dekadence is the 2011 filly (autumn foal) out of Replikah HF by the dressage stallion Dream Along (Oldenburg). She is 16.2+h and received her Premium mare status and Gold Premium medal as a 3 year old at the RPSI Inspections at Edenhof in the summer of 2015. She is absolutely correct in conformation, has the softest engaging temperament, and exhibits fabulous modern movement. Especially noted is that she is always uphill and has superior power and activity of the hind legs, always stepping well under herself even in the medium gaits. She is a rich dark bay/brown/black, depending on the season- thus her name. 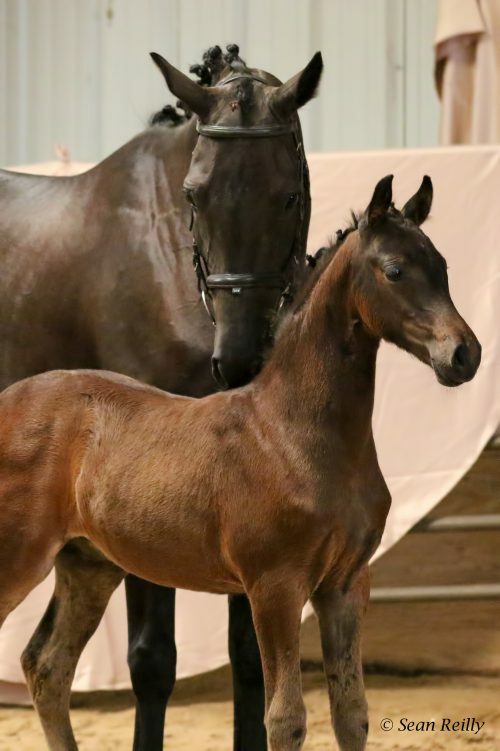 We are excited to announce that her first foal by FEI stallion,Boleem, born in March of 2016 earned Gold Premium status at her keurig which continues her grand dams legacy! For 2017, the German Riding Pony colt, Phineas Bunce, by Evans Providence of the Night rocked his Westfalen Inspection with solid 8’s thus earning Premium title! 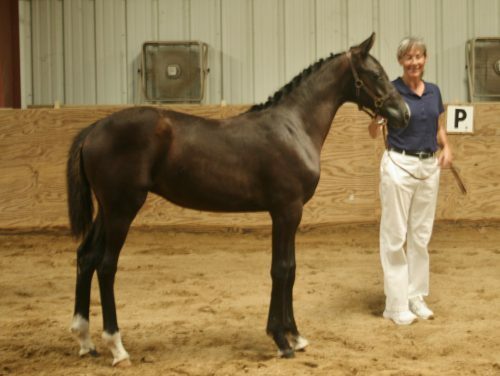 Her sire is the imported Oldenburg stallion Dream Along, owned by Margret Gafford of Sankt Georg Farm Int’l. Dream Along is the 2001 son of Dream of Love who was reserve champion of his stallion approval and unfortunately passed much too early. His grandsire was Dream of Heidelberg by Donnerschlag/Donnerhall. 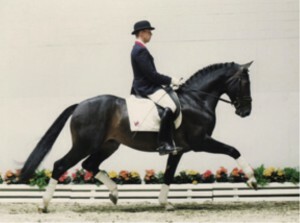 His damsire was the well known Holsteiner stallion Corleone who represents the Cor de la Bryere lines that have produced top dressage horses as well as top jumpers like Olympic Gold Medalists, Classic Touch. 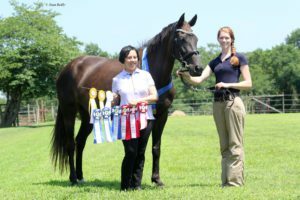 Dream Along accolades include Devon Stallion champion, Dressage at Lexington Stallion Champion, USDF Breeder’s Champion for the East Coast Series, and the Malachit Trophy winner. 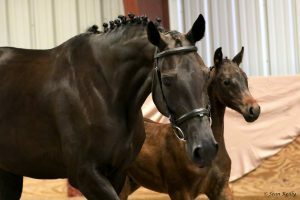 His offspring have numerous wins on the line at Dressage Breeding shows and are developing into brilliant dressage horses. Dream Along is reknown for passing his exceptional movement and disposition along to his offspring. 2016 filly, Brocade, out of Dekadence, and by the super producing stallion, Boleem is exactly what we were looking for from this combination! She sports a muscular compact body, with superior conformation, and a powerful hind end made for collected work. A medium frame, but truly elegant in presence! Brocade was Gold Premium at her RPSI keurig, and as she was specifically bred for our breeding program, she will be retained. 2017 colt, Phineas Bunce, out of Dekadence by our own German Riding Pony stallion, Evans Providence of the Night. He earned solid 8’s to secure a Premium title from the Westfalen inspectors! 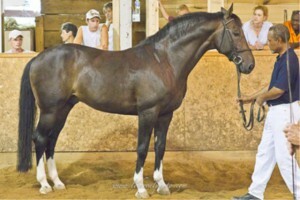 Energetic and a very modern mover, he promises to put his name to fame on the dressage scene!